A church has stood on the present elevated site for over 900 years since early Norman times. The ancient churchyard yews are even older, indicating that the site may have been used for worship in Saxon times. The Chancel has an arrangement of splayed windows which include a rare 'Vesica' window. 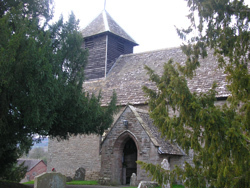 Read more about the work of this lovely village church on their website.